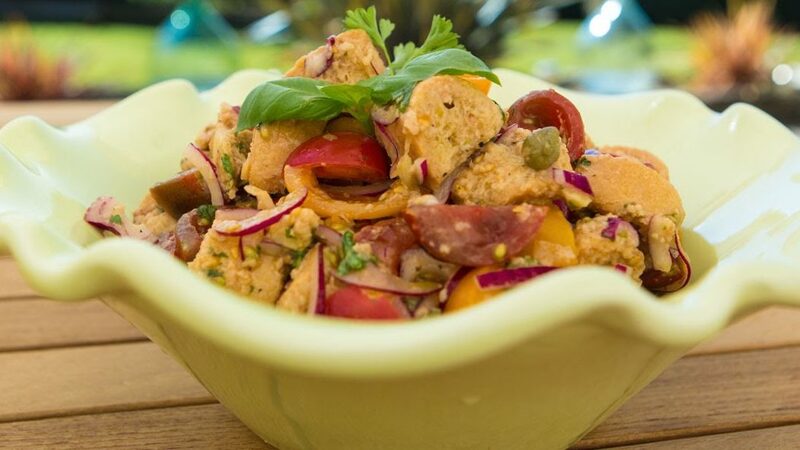 Panzanella Salad is of Tuscan origin. The lovely chunks of hardened bread are perfect for soaking up the delicious sunshine juices while retaining a natural crunchy texture. CUT the tomatoes into large chunks and place in a colander and set over this bowl and leave to drain while you prepare the other ingredients. CUT the bread into chunks about the same size as the tomatoes, place in a large salad bowl and moisten with vinegar. ADD to this your finely sliced onions, capers, and parsley followed by your drained chopped tomatoes and gently toss making sure you hold back the tomato juice. MAKE your dressing by mixing into the reserved tomato juice the chopped anchovies, crushed garlic, salt and pepper and then whisk in the olive oil. POUR over the salad ingredients and finally add the basil leaves tossing gently. Taste if additional salt and pepper is needed . COVER and allow to sit at room temperature for 10 to 15mins before serving to give the flavours more of a chance to mingle. TIP:Soak the finely sliced onion in a little salt & a drizzle of olive oil for 20 mins as this will deliver the sweetness without the bite.